As we age, our skin can become lax and uneven. Thermage is a popular cosmetic treatment option, and under the supervision of Dr. Skouras is performed by our experienced technician at Skouras Eye and Cosmetic Centre. This procedure safely tightens the skin, giving your skin a smoother, more even-toned appearance. Thermage is a skin tightening procedure designed to rejuvenate areas of the neck, face and around the eyes. It can minimize the signs of aging by helping to smooth out the wrinkles and fine lines that appear around the nose and mouth. Furthermore, Thermage can redefine the jawline, decrease jowls and minimize the fine lines around the eyes and eyebrows. In addition, many laser eye clinic specialists use Thermage to improve the appearance of both the lower and upper eyelids by tightening the area and decreasing the look of hooded eyelids. 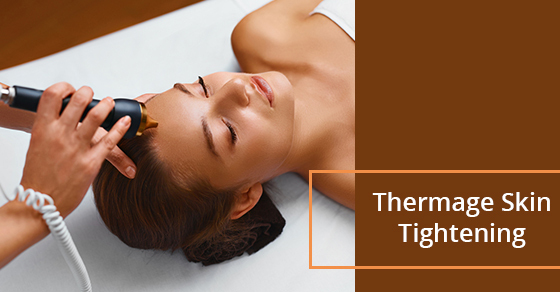 Thermage is a non-invasive procedure that uses heat to penetrate deep into the layers and underlying tissue of the skin. Using safe, radiofrequency energy, the collagen found in skin tissues is stimulated to create a tightening effect. Moreover, the energy used produces firmer, younger-looking skin by boosting the skin cells. The procedure also uses a cooling effect to ensure that you are comfortable during the procedure. Many laser eye clinic technicians like using Thermage because it is approved by Health Canada and the FDA, and the results it produces are significant. In fact, Thermage is so safe that it is the first and only FDA-cleared radiofrequency procedure for non-invasive eyelid treatments. Depending on the size of the area being treated, Thermage can take anywhere from 45 minutes to two hours. Thermage is a non-surgical treatment that does not require anesthesia, incisions or pain medication. The laser eye clinic specialist uses a handheld device that emits hot and cool sensations and mild vibrations over the treated area. Most Thermage patients report that their skin is red following their procedure; however, the redness usually subsides in a few hours. There is no downtime for Thermage and you can return to your normal activities almost immediately. The results are usually apparent within a few hours of receiving treatment and your skin will continue to produce new collagen up to six months after your Thermage procedure. The results generally last years, depending on your age and overall skin condition. You can prolong the positive effects of Thermage by regularly wearing sunscreen to protect your skin from the sun’s harsh UV rays. For your holiday makeover, contact our laser eye clinic and get beautiful, youthful looking skin to help you look and feel your best while ringing in the new year. You deserve to treat yourself!